In this review, we hit the casino’s to try the Atari 2600 gambling game, Blackjack. 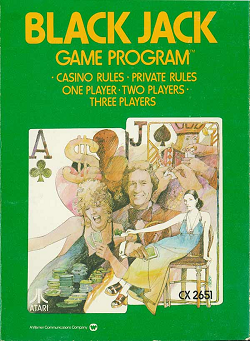 This game was released in 1977 and was a launch title for the system. The game is pretty straight forward, you play Blackjack against the house. Apparently, it is technically possible to win by scoring over 1000 (not that we’ve ever gotten anywhere near that). One rule that players should be aware of is the fact that this game favors the computer player heavily. One significant way this game doesn’t favor the player is that if you tie the house, you still lose. So, there’s no such thing as a push in this game. This game also has a bug in that the amount wagered is sometimes randomly reset between hands, so it is up to the player to make sure the correct wager is entered between hands. One thing I thought was strange was the fact that there’s technically only two suits that are visible: red and black. While there is four suits, the player cannot tell the difference between, say, a spade and a club. I don’t know why that is, personally, because there’s plenty of screen space to display a particular suit in my opinion. the graphics are extremely plain. There are numbers and letters that represent the different cards, but the table is a bland green backdrop with nothing extra added. I personally think more could have been added even with the limitations of the Atari to make the game somewhat better looking, but it seemed the bare minimum was achieved here. The audio was also incredibly limited. There are two notes to denote you winning a blackjack. Beyond that, the most basic of beeps and synthetic bass is present and nothing more then that. Overall, I’m not a huge fan of Blackjack, but that is beside the point when evaluating this game. I thought this was more a programmers exercise to demonstrate what can be achieved in a system more than any form of actual entertainment for players. Give this one a pass. It isn’t worth it. Furthest point in game: $243. This can cease an individual from registering for a particular reason and discovering they’re eligible for the things they imagined they were.